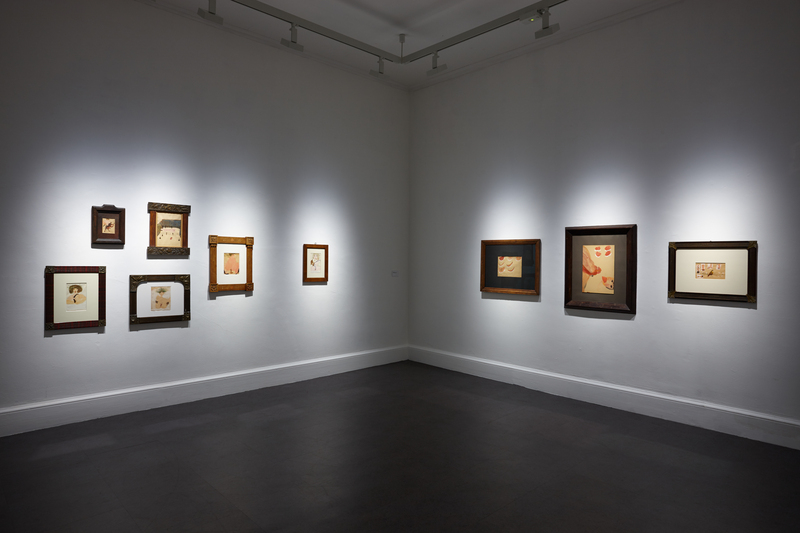 In our Gallery Voices series Evy Richard, from our Visitor Engagement Team, takes us on an insightful journey through the exhibition The Passion According to Carol Rama exploring the extraordinary life and work of Italian artist Carol Rama. The exhibition is now in its final week ending this Bank Holiday Monday 1 August. A tour of this exhibition is like having a chat. The curators at IMMA have tried to replicate the artist’s apartment in Turin, Italy, where she lived like a recluse for most of her life, until her death on the 25th of September last year. Meandering from room to room, through corridors and passing alcoves is also like being on a journey, discovering the nooks and crannies of Rama’s home. It is quite dark, lit low and black walls face you at mid corridor. And the title, The Passion. Double meaning here? The deep impulse to create, paint, draw, no matter what, where nor with what. The main emotion running through 80 odd years of this artist’s life. Maybe also the spiritual Passion, a transcending pain, exposure, the spiritual battle to overcome a lowly “human condition”. Born in 1918 into an affluent industrialist family, she started drawing at 14 and “ I never stopped, never” (Carol Rama). Her life takes a u-turn when her mother (also maybe her grand-mother?) is interned in a psychiatric hospital. Family conflict, business ruin, a father ousted as homosexual, his suicide? The conjectures are still rife as Carol herself kept a firm and unpredictable rein on her own history. Her death last September may now open more windows into her life. What is certain is that her years as a young burgeoning woman are crushed, distorted and her visits to her mother’s sanatorium will indelibly mark her, shape her as an outsider. Those delicate years of discovering her own femininity are distorted by her experiences. There she witnesses the castaways, the maimed, the misfits, the non-conformists females of the fascist era, all ending in these enclosed walls. The Passion According to Carol Rama, Installation view IMMA, 2016. Photo Denis Mortell. Her drawings showing these utterly sexualised, maimed, bed-ridden, sequestrated creatures are more than shocking. They revolt, they sadden. Because they describe a subaltern condition, its revolt, a revolting exposure of that condition. Those early drawings are encased in your typical upmarket middle class ornate frames. And you catch yourself not wanting to look anymore but unable to stop. So you move to another room. It seems done by a completely different artist. Geometric shapes, computer-like circuits. And you discover how Carol Rama reinvented herself at 40 years old in the 1950’s from the original ‘Olga Carolina Rama’ whose infamous exhibition had been closed by the Nazis in 1945. Trying to fit in as a “proper artist” on the scene or at least showing that she could if she wanted to. And then there is the corridor, there are gathered a series of objects and pictures, so esthetic, sleek, so simply elegant that it takes a little time to realise there are made with flattened tyres. That is no random, innocent choice either, her father produced bicycles. They are charged with memories, but transcended (the Passion reached?). 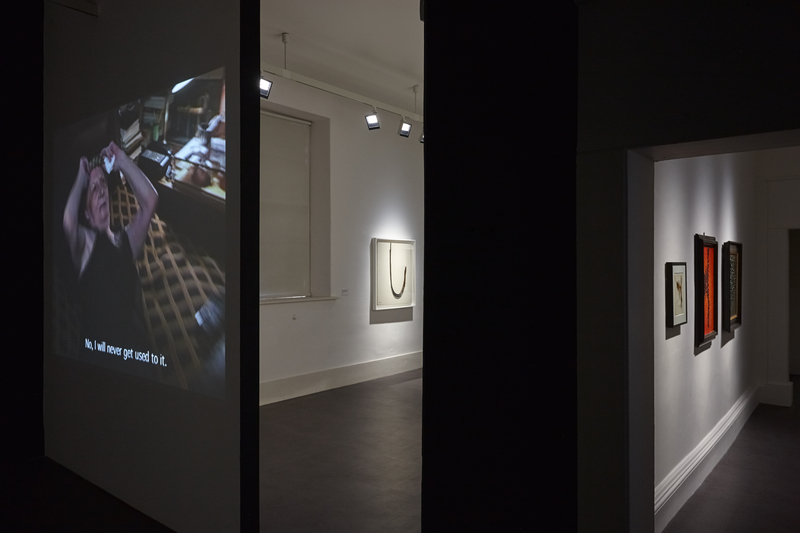 “ there are all those different hues, they are soft and supple, they feel just like human skin” Carol Rama says in the video shown as part of the exhibition. 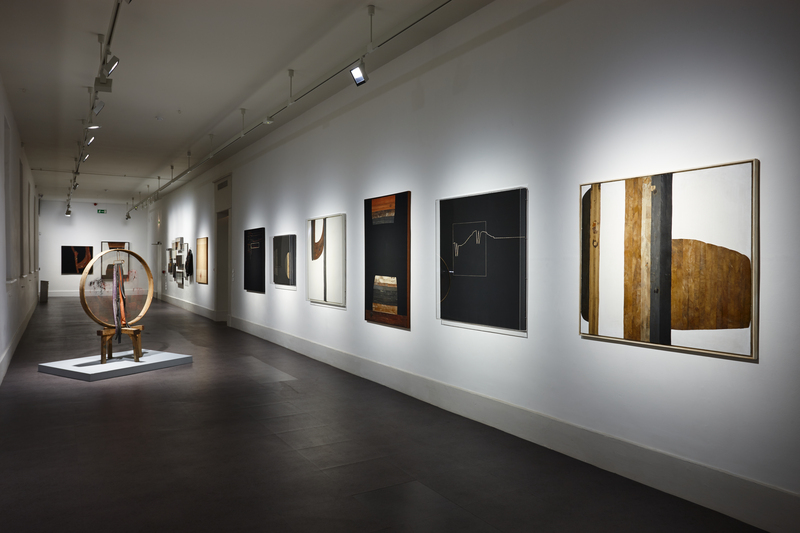 The Passion According to Carol Rama, Installation view IMMA, 2016. Photo: Denis Mortell. Because for me, the highlight of the exhibition was to see and hear her in an interview (Simone Pierini, Venice biennale award, 2003). This wisp of an old woman, with this tiny girly voice and middle class tempo. But the things she utters, wicked, crude, uncensored, sarcastic. Like a black, industrious, self-absorbed and ruthless spider holding court, but also smart, funny, eccentric and playful. A real “character” as they say in Ireland! Half genius and half obnoxious, an Italian version of Louise Bourgeois. 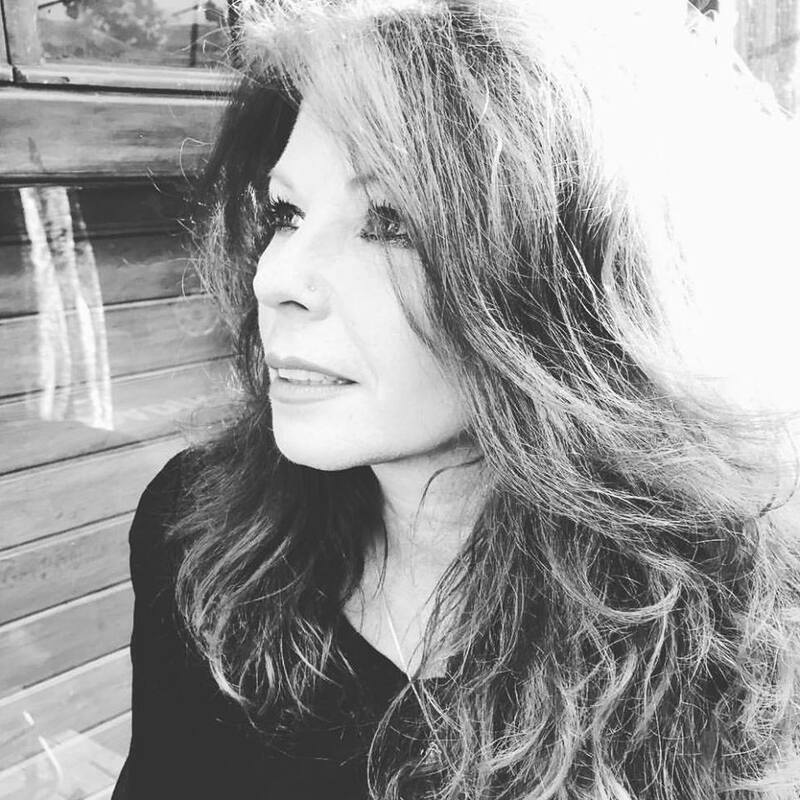 Like her friend curator Lea Vergine, I feel privileged as well to help a new generation to get to know her and acknowledge her contribution to Concrete Art or Novicimi Movements, Arte Povera and Queer Theory. 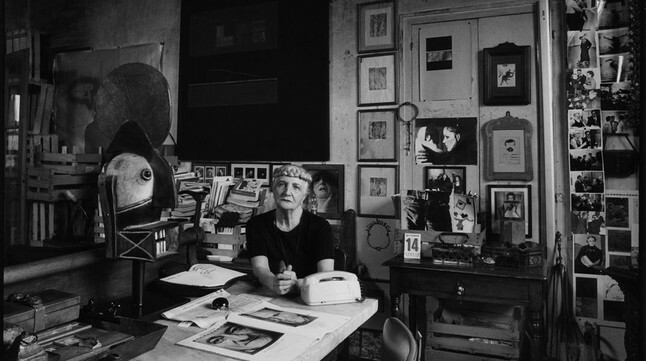 Her impact on Warhol, Bunuel, Orson Welles, her influence on Cindy Sherman, Kara Walker, Kiki Smith, et al. She sat in her obscure corner, making her ‘bricolages’ (‘tinkerings’), using and assembling the different bits of ideas and objects amassed through a lifetime. Indefatigable, constant in her output, juggling with animal claws, furs, glass eyes, ink, paint, like some mad revisited taxidermist (her mother’s heritage?). With this bizarre plait of hair coiled tightly around her head like a crown. 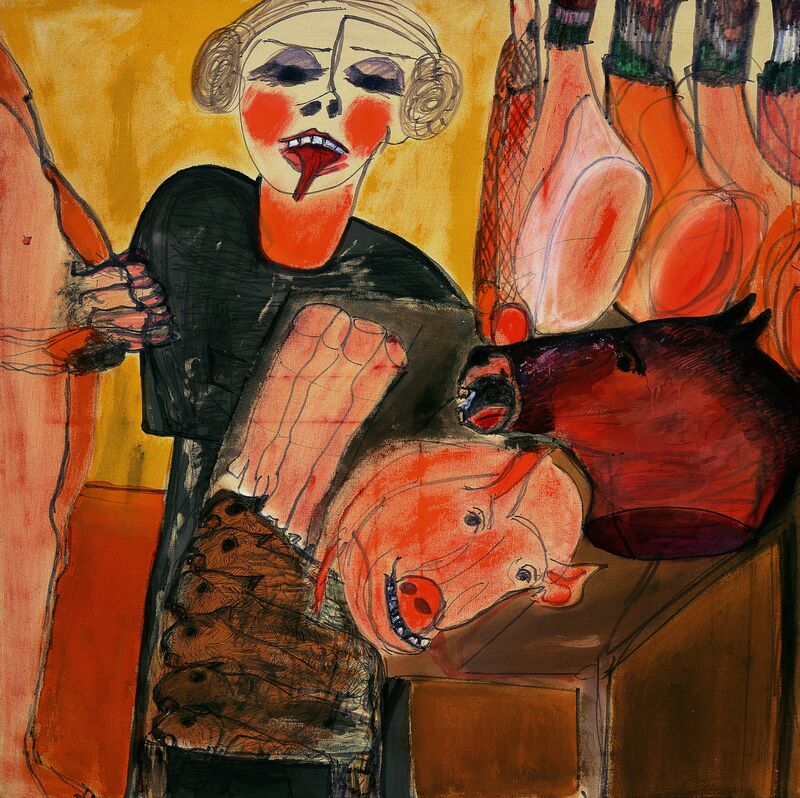 I recognise her in one of her paintings; girly girl, hair plaited, with her tongue out “the only organ that never ages” (Carol Rama), a butcher knife raised , standing behind a counter loaded with severed animal heads and quartered bodies. Her own take on Judith? Salome?. The whole exhibition is often experienced as a journey through her life. Touching, intriguing, descriptive, upsetting. You hear comments like “beautiful”, “tragic”, “marvellous”, ”awful”. Of course, she speaks volumes to women of a certain age (mine, the post middle-age one). “Was she depressive?” “did she herself have a mental illness?” are often asked by visitors. I often answer “does it matter?”. Blog by Evy Richard, Visitor Engagement Facilitator, IMMA. Will the Mistresses Tools Dismantle the Master’s House?